← And The Winner Is…US! Drugs! Various drugs! Get your drugs here! In February, I converted our linen closet to a coat closet. It’s a much better use of the space, but the change meant that some items needed to move out. 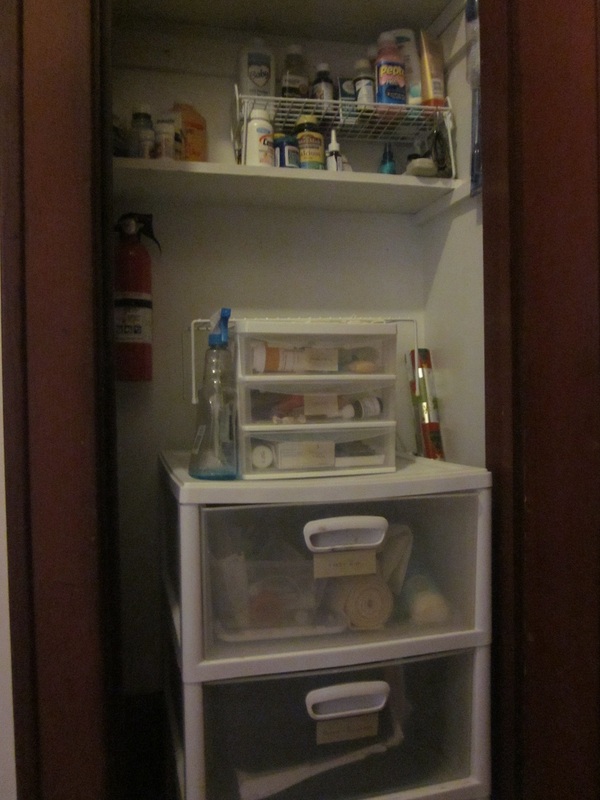 As I said at the time, it was “less a linen closet and more a pharmaceutical enclosure.” So many little bottles! Keeping a stack of pill bottles on the kitchen countertop (made us feel like we were 116). Kev’s solution: sweeping all the usual suspects into a box and stuffing the box on top of the blanket shelf in the coat closet (became more and more precarious every time it was stuffed into place). My response: leaving the box of pills on the floor of the kitchen after retrieving it (I’m too lazy short to effectively stuff the box on the shelf). Kev’s response to my response: Putting the box on the kitchen counter (led to stacks of bottles on the counter, which re-started the cycle). None of this was particularly promising for continued marital harmony, so I went to Ikea. What?! It sequiturs! It totally sequiturs. Ikea has a solution for everything! I wanted storage that could be moved if necessary and that didn’t require super-precise organization to work. 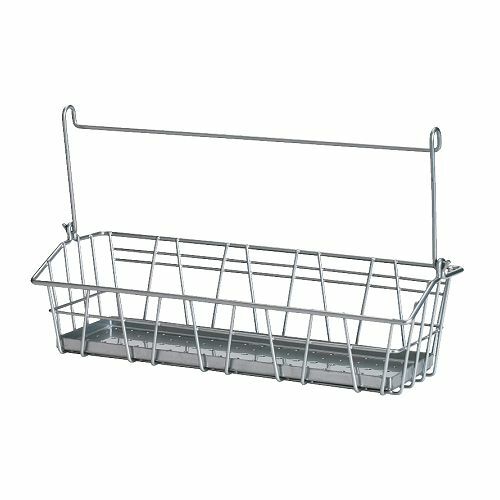 I bought some of these $2.99 wire baskets from the kitchen area. These baskets are designed to hang from a rail that juts out from the wall, but I had other ideas. The bathroom cupboard door has a recessed panel just wider than the baskets; the basket is 13 inches wide, and the recess is about 13¼. 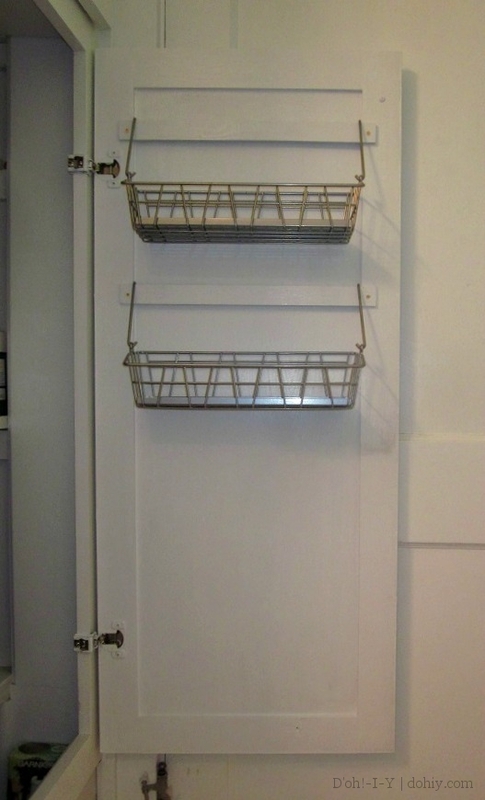 My idea was to hang them within that area so the baskets wouldn’t interfere with existing storage. I picked up a length of pine lattice to replace the rail and measured out a couple of pieces to span the door panel. I drilled mounting holes, then sanded, primed and painted the pieces. Using a level, I marked and attached the new “rails” inside the door. Then I hung up my fancy baskets. 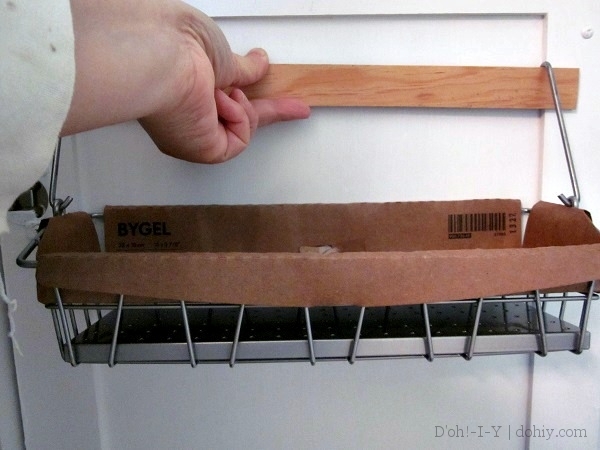 I love a good Ikea hack — not that this would qualify! It’s just a different way to hang a basket in a different place than intended. Perhaps it’s more of a marriage hack, since I won’t have occasion to leave boxes of painkillers under foot anymore (the Kev did not love that). 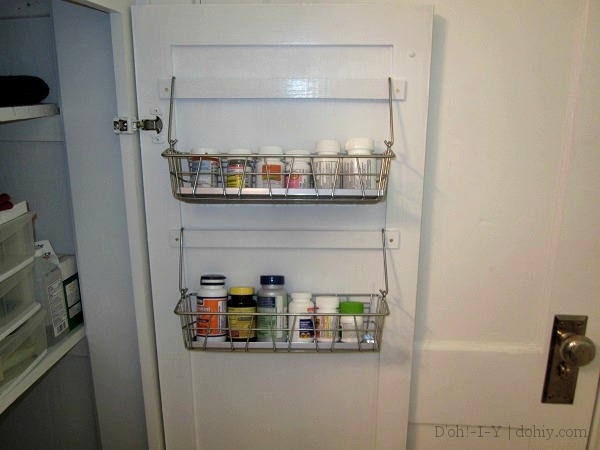 This entry was posted in Bathroom, Organization, Romance and tagged ikea bygel, ikea hack, ikea wire basket, recessed storage inside cabinet door, using ikea bygel inside cabinet door, ways to hang ikea basket, ways to organize medicine cabinet. Bookmark the permalink.